Schoolchlldren in Morocco. Photo Credit: USAID Morocco, Wikimedia Commons. Illiteracy is a worldwide impediment to development. Illiteracy among Muslims is still the most dangerous scourge and challenge that impede any optimum investment of human resources in the implementation of the national development plans in the countries of the Muslim world, writes the author, Dr. Mohamed Chtatou. Both focused on the need to combat illiteracy in all its forms, including alphabetical illiteracy, functional illiteracy, legal illiteracy, and computer illiteracy, considering that illiteracy constitutes a handicap that paralyses capacities and locks energies in a time where society needs the active involvement of its individuals and their full potentials to face up to the challenges, the requirements of competitiveness, the logic of globalization, as well as the rapid pace of scientific progress, technological breakthroughs and information revolution. Illiteracy among Muslims is still the most dangerous scourge and challenge that impede any optimum investment of human resources in the implementation of the national development plans in the countries of the Muslim world. Due to many complex factors related to the political, cultural, economic, social and demographic conditions, the efforts led so far in several Muslim States to combat and eradicate this scourge still prove inadequate. “Fact: Of the 1.4 billion Muslims 800 million are illiterate (6 out of 10 Muslims cannot read). In Christendom, adult literacy rate stands at 78 percent. Consider, for instance, that Muslims constitute 22 percent of world population with a 1 percent share of Nobel Prizes. Jews constitute 0.23 percent of world population with a 22 percent share of Nobel Prizes. Diagnosis 1: Muslims are poor, illiterate and weak because they have ‘abandoned the divine heritage of Islam’. Prescription: We must return to our real or imagined past. Illiteracy is undoubtedly one of the most terrible curses that can plague any given society because of its dire and unpredictable consequences. Ignorance leads to loss of hope in the future, which in turn can lead to radicalization and extreme solutions. 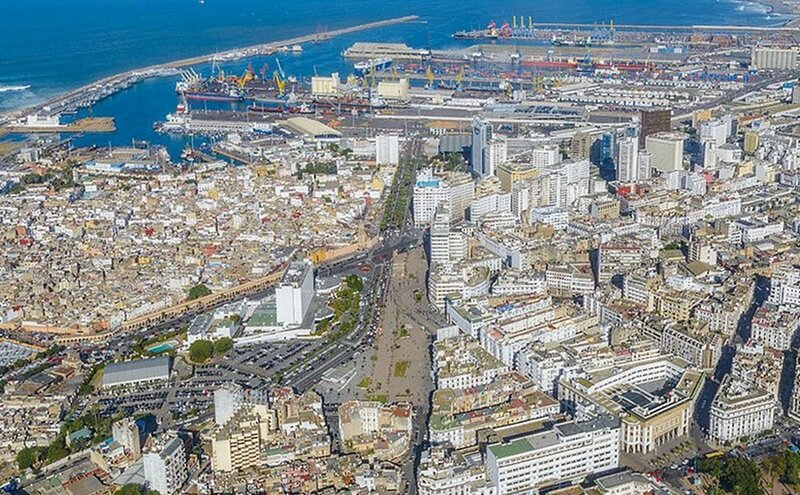 A case in point is the terrorist attacks of Casablanca in 2003 that were initiated by youth coming from Sidi Moumen shanty town in the periphery of Casablanca, who were unemployed, hardly educated and with no prospects in life. This youth was easily recuperated by maleficent individuals who brainwashed them into taking a violent action causing their death and that of innocent people, in the name of Islam. Morocco has to rely on a comprehensive approach that tackles the subject of illiteracy in its general and global framework, i.e. the framework of Education For All.iv Previous experiences as well as the outcome of evaluation and prospective studies on the situation of education in the world have shown that the plans for combating illiteracy cannot bear the intended results if they are conducted separately from the plans for providing education to all social categories, particularly the vulnerable categories prone to marginalization in education such as the early childhood, women and young girls in rural and remote areas, the elderly, the handicapped, the refugees, and people of no fixed abode. With that in mind, Morocco will have to seek to schedule an array of activities concerning the education of these categories, adult education, combating alphabetical, legal, functional and computer illiteracy, while focusing on areas and categories where the need is most felt, such as the category of women, knowing that the concept of illiteracy is ever-evolving and extending. Port of Casablanca, Morocco. Photo by Brio-En, Wikipedia Commons. The city of Casablanca is surrounded by a belt of poverty made of several shanty towns where ignorance reigns supreme and, as such, are eligible to become hotbeds of extremism in the future if unchecked and assisted. Poverty is not a fatality; it can be reversed if officials show a minimum of goodwill and responsibility. Like the Chinese say, you do not render a service to an individual by giving him fish but rather by teaching him to fish and transfer to him the know-how. Personal development and emancipation can only be achieved through empowerment which can be effected through literacy and adult education. Helping set up coops for these programs’ beneficiaries on conclusion of instruction. The path to Education for All starts long before primary school. A number of scientific studies in psycho pedagogy have shown that the first steps of life, during early childhood, are vital for later success in life. That is why, family literacy and inter-generational literacy programs are of paramount importance for the cognitive, health and nutrition needs since they contribute to building literate and learning societies. Indeed, inter-generational linguistic transfer and the link between the literacy of parents and children provide firm ground for children’s enrolment at school. Therefore, it is vital to invest in early childhood education and care both at the formal and non-formal levels. In addition, the EFA Global Monitoring Report 2009v states that the gender dimension is one of the important parameters of the current disparities affecting access to literacy. Indeed, out of the 776 million persons who are deprived of the basic skills in literacy, women account for the two thirds. Therefore, it is imperative to step up efforts to develop literacy strategies for women. That is why; it has been noted by the major recommendations issued by CONFINTEA VIvi regional preparatory conferences that the States should promote integration through training programs which accommodate the specific expectations of minorities, vulnerable and marginalized groups and categories with special needs. Apart from the social fracture relating to the gender dimension in literacy, one of the major challenges of the World Literacy Decadevii is the marginalization affecting some social categories such as the handicapped, the homeless and the persons of no fixed abode. In this regard, one of the main challenges for Education for All consists in the elaboration of inclusive literacy strategies for the benefit of these social groups. The preparatory conferences for the Sixth International Conference on Adult Educationviii recommended the necessity to enhance the possibilities provided by information and communication technology in literacy and adult education. Being useful instruments for enhancing the quality and efficiency of literacy and adult education programs, these technologies provide access to mobile and remote populations via distance learning. Indeed, ICTs prove effective in creating educational environments more adapted to the needs and concerns of the social categories which are excluded from the educational system. Therefore, it is imperative to highlight the importance of these technologies as a training tool. In order to enhance the capabilities provided by ICTs in literacy, as recommended by the participants in the African Regional Conference on Literacy in the World,ix innovation should be stimulated in science and technology, through expanding the use of scientific terms in literacy languages and benefiting by audiovisual teaching materials to expound scientific concepts, building on the analysis of local practices. Against this backdrop, this program will aim at enhancing traditional technologies such as radio, television and the press and channeling them into literacy and adult education. During the Arab States regional preparatory conference for the Sixth International Conference on Adult Education,x the recommendations called for mobilizing diversified additional funding sources, internal and external, to implement literacy and adult education programs. In this connection, models of Islamic solidarity such as zakat, social charity actions and endowments (Waqfs) have been highlighted as possible off-budget funding resources. Accordingly, this program will seek to activate these funding sources, wherever possible. Morocco is, alas, a country that has natural resources but not high cash-earning ones such as oil or natural gas, its economy traditionally relied on cash-crop agriculture which in turn relies on rain fall that extremely irregular in the North Africa region. As such a good portion of the population is endemically poor and also illiterate. Generally, these people to make a living are street vendors, peddlers, pick-pockets, petty crime agents, etc in cities. In the countryside the poor rely on tribal solidarity, fortunately still active, or opt for migration to cities with hope for better living prospects. 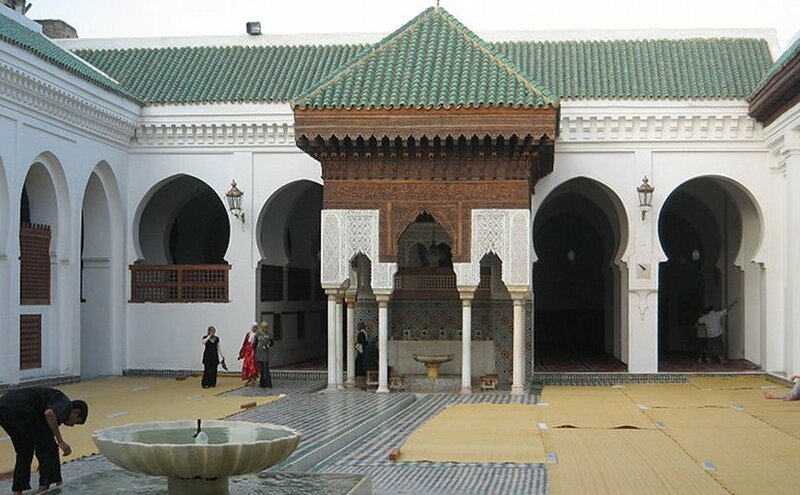 Morocco, in spite of high-profile programs such literacy programs provided by specialized institutions, civil society, mosques, etc. and poverty-alleviation schemes initiated by the Initiative Nationale pour le Développement Humainxi (National Human Development Initiative)xii have not been able to get rid of neither illiteracy nor poverty. So, Morocco remains a fractured country with two classes: the elite and the poor,xiii bearing in mind that the middle class that acts as a shock absorber between the afore-mentioned ones has been obliterated by the economic crisis of 1982. Courtyard, Al-Qarawiyyin University, Fes. Morocco, the oldest in the world. Photo by Khonsali, Wikipedia Commons. Literacy efforts of Morocco are time-old and ineffectual whether undertaken by government or civil society and consequently the end results are not as beneficial as expected so illiteracy remains very high especially in Amazigh-speaking areas and it s coupled with poverty and resulting discontent. Community-based literacy solves both the problem of literacy and poverty and anchors the population in its community, thus, barring any temptation for migration or displacement for economic reasons. What is more it helps create local wealth that spawns regional development. Practical literacy: teaching political rights and obligations, hygiene, reproductive health, human rights, etc. Vocational literacy: teach learners skills that will help them become local entrepreneurs, artisans or technicians. 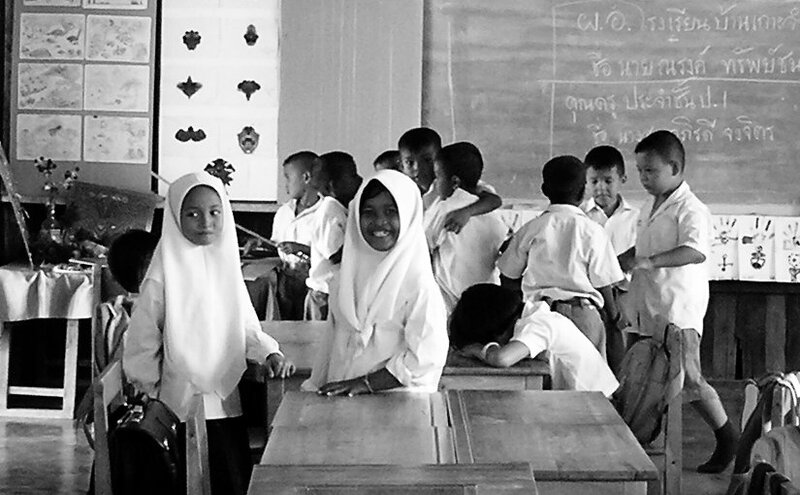 The community-based literacy program is conducted by local instructors, local literacy specialists and supervised by local people who are well-known in the community for their knowledge, integrity and community dedication. These people during the lifetime of the program have to conduct town meetings and one on one encounter to measure the advance of the program and evaluate its academic and technical progress. Specialists and instructors will be encouraged to communicate non-stop with learners and push them to talk about their progress, possible problems and their perception of program’s progress. The instructors, specialists and directors will receive in-service training now and then in the up-to-date techniques and approaches and their evaluations and continuous feedback will be taken into consideration. They will have to be made to feel like the learners, all the time, that the program is theirs and its success is their success and that any external help is merely facilitation. The course content will be crafted and created by local educational actors who know both the learning needs of the target people and their vocational aspirations. The program has to be hundred per cent community-based and fully responding to local needs and this throughout its duration. The word “community-based” is not a vain word it is a philosophy that highlights the concept of ownership. In a word, the program is part and parcel of the community and it is totally owned by its recipients. External facilitators can only bring expertise and funds, no more. Fast track: the program lasts two years (eleven months a year with August off) of four days a week (Monday to Thursday), seven hours a day from 9 am to 5pm with an hour for lunch and rest at 1pm. Practical literacy: 2 hours a day. Slow track: the program lasts three years (eleven months a year with August off) of four days a week (Monday to Thursday), four hours a day from 1 to 5pm. To combat illiteracy in the 21st century in all its dimensions which include expression, communication, cultural identity and socio-economic development, a number of factors are to be taken into account in training methods and the content of relevant programs. Concerning the training methodology, it is obvious that the use of information technologies plays a pivotal role in training. Indeed, the computer has become an educational tool since it provides an oriented education that enables learners to acquire basic skills. It, also, facilitates access to learning materials through Internet or compact discs. Besides, the computer provides the opportunity for individuals to learn according to their own capacities and preferences without being discouraged by the evaluation results. Therefore, to provide education for all, the various traditional and contemporary forms of literacy have to be taken into consideration. Every time the learners’ needs, specificities and working conditions are taken into consideration in literacy systems, the learners become more engaged in the literacy process since some groups of learners prefer traditional systems whereas others opt for modern systems of literacy and distance training. However, in order to stimulate adult learners’ interest, training should address their needs in terms of economic development while taking into consideration their cultural specificities. In this connection, training should develop the learners’ skills and enhance the technical and professional qualification process in society through adopting multidisciplinary approaches on the one hand, and should be part of a set of policies and programs that address the learners in their mother tongue and in other languages, if necessary, and using the script that suits their preferences on the other. The analysis of educational innovations in literacy programs shows that quality programs focus on the learners rather than on standard programs or norms. Therefore, quality literacy programs ought to accommodate the diversity of ages and learning patterns as they are deeply entrenched in the socio-economic context of the learners and have been designed in accordance with the interests of individuals and communities. At the educational level, priority is given to an interactive learning instead of a teacher-centered pedagogy. The fourth objective of the Dakar Framework for Action provided for achieving a 50 per cent improvement in levels of adult literacy by 2015, especially among women, and equitable access to basic and continuing education for all adults. This requires conducting prospective studies to understand all non-formal education patterns which can be employed in our societies. This in turn calls for devising a more flexible system to evaluate the acquired attainments as part of a sustainable perspective on literacy, in accordance with the recommendations emanating from the French-speaking countries preparatory meeting for the Sixth International Conference on Adult Education (CONFINTEA VI). The competencies required in literacy staff vary according to the field of their intervention and the category to which they belong. Literacy staff include those entrusted with policy elaboration and are tasked with planning and management; they also include technicians who are assigned educational functions and training. Seeking to provide constructive training, the program will carry out training programs for staff as per the needs of each category. As part of this approach, it will organize for the benefit of leaderships, officials and administrative staff, national and regional seminars in the field of planning literacy and post-literacy programs, provision of the necessary financial resources for them as well as their management, follow-up and evaluation, in addition to mobilizing the society towards addressing literacy issues in order to further communication between political and administrative staff and the neo-literate social groups using the national language. One of the shortfalls in the literacy efforts led in a number of countries is relapse into illiteracy. After having acquired the basic knowledge and skills, the neo-literates relapse into the scourge of illiteracy because of the lack of conducive environment for learning, especially in the absence of post-literacy materials. In this connection, the French-speaking countries preparatory conference for the Sixth International Conference on Adult Education discussed the methods for the prevention and eradication of illiteracy. To counter this possible development, this program will create reading centers that will dedicate activities for neo-literate adults with the aim of preventing relapse into illiteracy. In the light of the evaluation results and needs, new reading centers will be created for neo-literate adults. Within the framework of this program, support will extended to community libraries through providing various post-literacy teaching materials, as well as collecting a number of texts pertaining to laws, economic development activities, health, religion and cultural traditions to be made available to neo-literates. To improve the external output of literacy and adult education programs. To propose innovative programs to teach the basics of informatics. The United Nations Literacy Decade (UNLD) is an initiative adopted by the global community through a unanimous resolution of the United Nations General Assembly. The Decade was launched in New York at the U.N. in February 2003 to mobilize the resources and political will required to meet the learning needs of the hundreds of millions of illiterate people living around the world. Given the powerful impact of literacy on the full range of human endeavours, the UN has decided to identify certain themes for special attention during the Decade. xii. “The National Human Development Initiative is a program launched in 2005 by King Mohammed VI of Morocco with the objective of “ensuring a better distribution of the fruits of growth and to improve the living conditions of citizens”. The program has a budget of 10 billion Dirham (about Euro 900 million) over five years (2006-2010). It is distributed equally between two country-wide programs (one called a “transversal program” and a “program against precarious living conditions”) and two geographically targeted programs (an urban and a rural program). 60% of the program is financed by the national government, 20% by local governments and 20% is to be financed by external donors. For the urban program, committees at the local level identified 264 urban neighborhoods with the greatest needs in 30 cities that would benefit from the initiative. The neighborhoods have a population of 2.5m or 16% of the country’s urban population. The rural program targets the 348 rural municipalities where the poverty level is higher than 30%.